It's interesting that Samsung has decided to announce the new ARM based chromebooks just after the Microsoft Surface price announcement and before the rumoured announcement if the iPad mini. The chromebook is an excellent idea spoiled by reality - as I've said elsewhere the lack of reliable always on internet makes its use problematical in a lot of locations, and to be honest, after my experiments with the seven incher I can confidently say a no name android table with a keyboard provides a functionally equivalent experience for a lower price, and you can still type on the bus. So what's the use case for a chrome book? A low cost laptop for the kids to do their homework on ? Not that stupid a scenario as they're probably relatively unbreakable and if one dies you just get another one the same. Andrew Jackson of the British Library has recently published a study of the use of particular file types over time, focusing on pdf, image and HTML file versions in an attempt to define whether being widely distributed and in use is a guard against obsolescence. However what it does show is that once a format is in common use it is protected against obsolescence. The real problem is with formats from the days before storing documents on the web became the default for many people and the conventions were not fully established. For example I recently needed to check some documentation about a legacy file format. The manufacturer had put the documentation on the web as TeX files. While perfectly readable this did entail installing OzTeX to read the downloaded file. Andrew's study also did not address the problem of legacy media formats such as exabyte tapes and the rest. To be fair he explicitly only looked at the UK web corpus, which by definition is online, which meant that he was only concerned with file formats, not media formats. I was idly musing about my tablet experience over the weekend, and suddenly I had a light bulb moment. The iPad is clearly a consummate device for consuming content. It doesn't work for work because work involves doing things, such as replying to emails, producing notes, other short form documents etc. My experiments with my no name seven inch tablet show there's a use case there. But it is kind of hobbled by the software base. Android (and iPad) lacks the software base required for serious full out work, at best they can be said to be useful tools for supporting work. That's why people on the whole buy MacBook Airs and other similar ultrabooks rather than Asus Transformers. Enter the Surface. A computer that's supposed to have a more business oriented software base, but which has the virtues of tablet computers - low power consumption, long battery life inutitive interface (in a year we'll all be using the interface formerly known as Metro and will have forgotten about start menus). So Microsoft have identified a gap in the market, produced a solution, and given's Microsoft's near total ownership of business computing, grabbed a chunk of market real estate. As anyone following this thread will know I bought myself a no name seven inch android tablet and keyboard combo as a note taker for work. 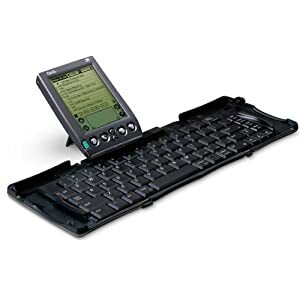 I've had a long hunt for suitable tools over the years, and until I tried the tablet and keyboard combo the most effective and portable solution I found was a palm pilot and keyboard combo back in 2003. Everything else in the intervening years has either been too heavy, had poor battery life or some combination of the two. I also find typing on glass keyboards on tablets a frustrating experience for extensive note taking. The original use case was that the reasonably long battery life and use of a keyboard would allow me to take notes in meetings and either put them straight into dropbox or evernote. The long battery life is a definite plus - making it more usable than a netbook - basically I charge it using the car charger when I drive in to work and away on the way home and that gives me adequate power for a working day unless it's one dominated by seminars or workshops where I find myself taking lots of notes. It also of course lets me check email, twitter, and send me calendar reminders etc. Basically it works, and definitely improves my effectiveness. However the actual use pattern has turned out to be not quite what I expected. Originally I thought I would use epistle - a simple text editor and save the files to dropbox to be cleaned up a later date. In fact (having tried ted and rejected it due to its poor export capabilities) I found myself going back to textedit to take notes and then mailing the files to myself as a more effective method. I found I was more likely to put the effort into cleaning things up if the files were in my mailbox. (I'm not an inbox zero person, but I've evolved my own technique that has the same effect using gmail's starring and labelling). Spellchecking is important - unlike say my original Asus netbook the keyboard has genuinely small keys close together. It also suffers from keybounce or even misses characters - basically a better keyboard would improve matters. The small keys are also a problem. Having large european male fingers I find myself sympathising with the late Steve Jobs over the need to file down my digits to type effectively. J, who has small hands and doesn't suffer the key mistrike problem, or indeed hitting two keys at once. I am however getting better - practice helps.